This week, the penthouse apartment of the old BBC centre development was unveiled to the world, with interiors inspired by 1970s living. With a £3 million price tag, the multi-level apartment is designed by fashion designer Bella Freud, who you might also know as the daughter of Lucien Freud and granddaughter of Sigmund Freud. 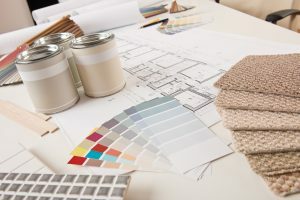 The colour palette of the design she’s created might be challenging for some, with bold, retro mixes of colour such as green and orange throughout the living room. Take a look at it over on DeZeen. It almost looks like this place was designed in the 70s and only just uncovered, and possibly the most controversial part of the whole design is the carpeting. The living room is bright, vibrant green, particularly challenging when up against the orange sofas, while one bedroom is carpeted in orange, with matching orange walls, and another in mustard yellow. Greys and beiges have long been the favourites for carpet, as they provide a neutral base to build your scheme on. However, interior trends have become decidedly more colourful in recent years, and as more and more people aim to create interiors that are likely to go viral on Instagram, colourful carpet may well be the next big thing. The property, in White City, London, is on the market for £3 million.